The Shaw Festival, in collaboration with Obsidian Theatre, is presenting a play from South Africa for the first time. Athol Fugard’s highly autobiographical 1982 play “Master Harold”...and the Boys is set in 1950 in a diner in Port Elizabeth, South Africa, almost 500 miles east of Cape Town. There Fugard dramatizes an incident which he says tainted his whole life. From its amiable beginnings the play builds in power until its devastating conclusion, a demonstration of the poisonous influence of the apartheid system on both blacks and whites. The action takes place in the St. Georges Park Tea Room rendered with extraordinary period and local detail by designer Peter Hartwell in what may be the most elaborate set ever seen in the Court House Theatre. 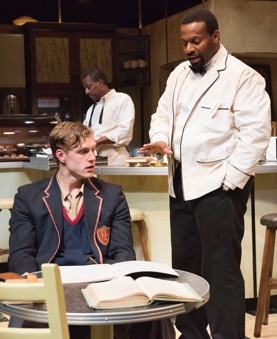 The single white character in the play is the teenager Harold (James Daly), called Hally, the stand-in for Fugard, whose real first name is also Harold. The owner of the tea room is Hally’s mother, but she is away tending to her husband in hospital who is an invalid and an alcoholic. 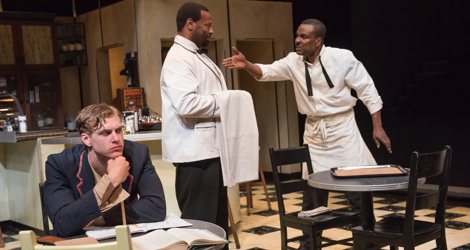 Hally’s mother does not like her son mingling with the black men who were her servants and are now her restaurant staff, but, as soon becomes obvious, Willie (Allan Louis) and especially Sam (André Sills) are the only people Hally feels comfortable with. Were they not such friends, protocol would demand that Sam address Hally as “Master Harold” as does the more conventional Willie. But, due to his parents’ pre-occupation with their own problems, Sam and Willie have basically brought Hally up for the past 17 years and Sam in particular views himself almost as a father to Hally. Before Hally enters, Willie has been complaining about the difficulty he has practicing ballroom dancing with his girlfriend in preparation for the local ballroom dance championships. Uttering a truth beyond ballroom dancing, Sam tells Willie that he wouldn’t have so much trouble with his partner if he didn’t beat her for not learning the steps. When Hally arrives the atmosphere changes since the teenager is unhappy with school and even more unhappy with the fear that his mother may soon bring his father home. When home Hally’s tyrannical father’s habit is to repay the constant attention he requires with insults and arguments. In fact, it is because his father was so unbearable when Hally was growing up that Hally first sought refuge with Willie and Sam. Knowing this Sam tries to allay Hally’s anxiety by having Hally read passages from books he has to study and explain the words Sam doesn’t understand. One of these words is “magnitude” and Sam turns using the word into a game for the three in choosing a man deserving the title a “Man of Magnitude”. one of those finalists on the dance floor is like… like being in a dream about a world in which accidents don’t happen.... It’s beautiful because that is what we want life to be like”. Unfortunately, the real world is full of collisions. The phone calls Hally receives from his mother become more distressing. In the final one he learns his father will be coming home that day, which for Hally means that the period of freedom and happiness he has had in his father’s absence will come to an abrupt end. Now that his worst fear has been realized, the immature Hally has to release his pent-up anger and frustration and vents it on the “boys” there in the diner. It’s a terrifying scene, impeccably acted, in which Hally says and does things that perhaps can never be unsaid or undone. In a foolish attempt to make himself feel powerful just when he has been rendered powerless, Hally suddenly asserts the racial and social divide between him as a white man and the black men as his servants as sanctioned by apartheid. Though the black men are old enough to be his father, Hally now insists that Sam call him “Master” as Willie always has. Director Philip Akin has beautifully shaped the action along the lines of an exponential curve. For most of the play’s 90 minutes the action is placid despite disturbances from the phone calls from Hally’s mother and some of Hally’s own unconsciously racist remarks. Yet, the final phone call sets the curve of the action shooting upwards so that we have no idea whether any rapprochement between Hally and the two men will ever be possible. For Willie and Sam, the final deeply ironic image is a symbol both of what they have lost and the realization that they will have to make their own world themselves. Given the importance of the image of the dance, Akin seems to have choreographed the entire play with Sam, who counsels Willie and who has always mentored Hally, subtly leading the two to learn more about themselves. Newcomer James Daly gives an excellent performance as Hally. We can tell from his speech and gestures that his mood is already volatile when he enters. His initial petty argument with Sam over what he should eat already establishes that assertions of power amid a general feeling of powerlessness are at play in him, both because he is simply a rebellious teenager and because he lives in a society that treats whites as inherently superior to other races. Even when Sam manages to calm him or distract him from his worries, Daly still clearly communicates to us an internal instability that ultimately cannot be contained. Willie appears to be the more timid counterpart to Sam. He has always called Hally “Master Harold” as social rules dictate and he never tries to intervene when Sam and Hally are having a conversation. Yet, Willie is the one who beats his girlfriend in frustration, so we know he is not quite as meek as he seems. Allan Louis masterfully conveys this complex mixture of attitudes and he makes it clear that Willie knows that losing his temper with his girlfriend is a sign of his own failure – an important analogue to what will be seen later when Hally loses his. André Sills has played supporting roles in so many plays that it is a pleasure to see him take on a rich, major role like Sam in “Master Harold” and meet its challenges with such grace. Sills shows us that Sam knows what his place is in the enforced scheme of apartheid, but he also shows how invaluable it is to Sam that his friendship with Hally breaks its artificial rules. Sam plays the child and lets Hally teach him about subjects he doesn’t know, obviously relishing the chance to learn even from a boy who doesn’t appreciate the gift of education. Sam is Hally’s sounding-board for all his troubles with his parents and is his counsellor in life. Through all of Sam’s interactions with Hally, Sills allows both parental pride and irritation to shine through. Circumstances have made Hally the boy that Sam has raised and even if Hally appears as a reckless, callow youth to us, Sills never lets us forget that the bond between Sam and Hally is one of love, even if Hally doesn’t fully understand it or, as a teenager, wish to acknowledge it. Sam is wise enough to know what effect that final phone call will have and tries to ward it off, but when he can’t, Sills’s depiction of Sam’s devastation is heart-breaking. This is one of those productions that you instinctively feel is perfect right from the start and that grabs you at the conclusion in a way you hardly expect. The ache you feel after the show ends does not go away soon, nor should it because the play is such a potent reminder of the injury racism does not only to individuals but to society in general. “Master Harold”...and the Boys is a great work, brilliantly acted and directed, that demands to be seen. 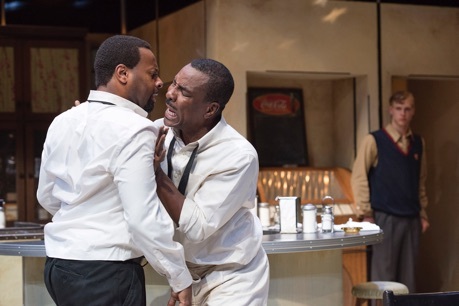 Torontonians who can’t make down to Niagara-on-the Lake before September 11 should know that Obsidian Theatre will remount the production at the Toronto Centre for the Arts in October – a great boon for a show that otherwise, given its stature, would have too short a run. Photo: (from top) James Daly, André Sills and Allan Louis; James Daly, Allan Louis and André Sills; André Sills, Allan Louis and James Daly. ©2016 David Cooper. For tickets, visit www.shawfest.com or www.tocentre.com/whats-on.